HIROSHIMA - Foreign residents braved scorching temperatures and joined hundreds of volunteers in Hiroshima Prefecture over the weekend to help deal with the aftermath of the recent rain disaster, an effort they said was meant to show gratitude for the hospitality they have received living in Japan. Supporters and volunteers alike called for more help in affected areas, especially in remote locations, and encouraged others, including foreign residents, to assist as much as possible. As of Monday, about 12,100 homes have collapsed, been damaged or flooded in Hiroshima in the wake of the torrential rainfall that hit western Japan in early July. Sporting rubber boots, loose trousers and a fluorescent green vest distributed to group leaders, Mongolian Munkhbat Manduul, 27, was setting the pace of a sandbag relay Sunday outside a house affected by a landslide on Ninoshima — a small island of 3.87 square kilometers located south of Hiroshima port and part of the city’s Minami Ward. He was among 360 people who came to the island that day by ferry and spent the entire morning digging out mud from houses, carrying bags filled with sand and piling them up to build fortresses near affected properties to shield them from further damage. He said top-ranked Mongolian sumo wrestler Hakuho has offered assistance by renting a bus to dispatch a group of 20 compatriots from Chiba Prefecture to Hiroshima for the weekend. The yokozuna has used his celebrity status to help collect supplies for disaster relief, alongside efforts from the rest of the Mongolian community in Japan and the yokozuna’s fans. Horrific scenes of collapsed structures and buildings filled with mud have brought sorrow to the local community. Most residents of the island were born and raised there. “I was moved to tears. 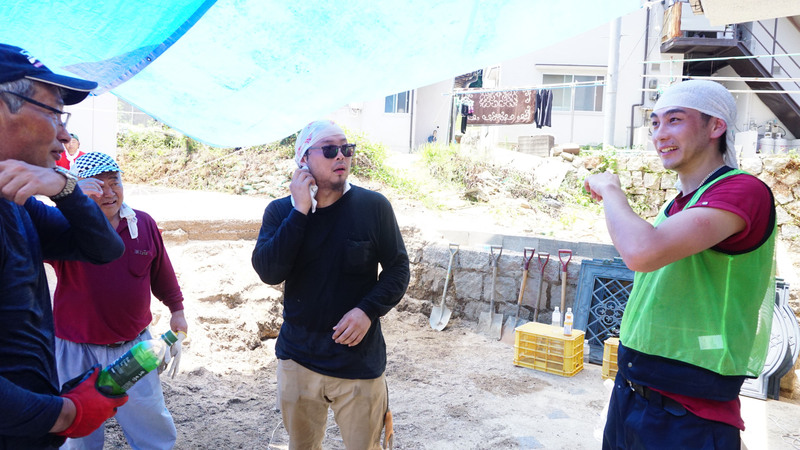 I’m really grateful for all the help,” said Sayuri Taniguchi, 55, who grew up in a house that was devastated by the disaster. The Mongolian volunteers were digging out the wall of sand outside her family home that had piled up after a nearby river flooded and brought along mud, blocking the entrance. She was worried that, in the case of future heavy rainfall, muddy water could overflow again, as the riverbed was still filled with sand. 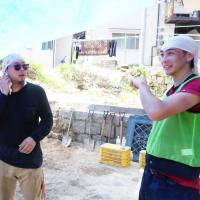 Piotr Szalczynski, a 29-year-old drone designer from Poland who has lived in Japan for over a year and used to work in construction, took a 12-hour bus ride from his home in Saitama Prefecture to Hiroshima’s Aki Ward, where he spent four days helping with recovery efforts. He was among 400 people who were dispatched by bus to areas hit hardest between West Japan Railway Co.’s Hiroshima and Kure stations, where services have been mostly suspended due to damage. Community members called for more help. On Monday morning, only eight people, all of them Japanese, came to help an elderly woman in the mountainous city of Akitakata, also in the prefecture, about 50 km away from the city of Hiroshima. As of Sunday, more than 100 houses or their foundations had been flooded, according to Atsushi Soga of Akitakata’s social welfare council. The city has a population of about 30,000. “I’m sure we’ll still need help at least through August,” Soga added. Click here for more information about volunteer opportunities in Japan.